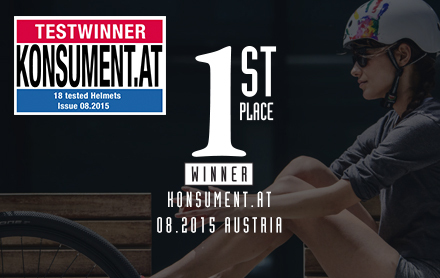 The brand Melon® Helmets is the winner of the current helmet test by the Austrian consumer association Konsument.at and is able to compete against established international brands. Thereby the array of awards of the last 24 months continues. The stylish lightweight helmet received the Eurobike Winner Award 2013, the Red Dot Winner Award 2014 and has been tested by the independent Swiss EMPA institute on behalf of the TV magazine “KASSENSTURZ” as the best tested trend helmet in its class. In 2015 the Melon “Urban Active” was awarded as “the editors recommendation” in the DIN-test of the magazine “aktivRadfahren” in Germany. Now with the victory in Konsument.at the test hat-trick is perfect. The testers examined the helmets stricter than ever before. In the latest test: 18 helmets of popular manufacturers. Only three of them, scored with the test result “good”. The helmets were tested in the categories “accident protection”, “handling”, “comfort”, “heat resistance” and “chemicals”. Basis of the Konsument.at test was the European standard for bicycle helmets CE EN 1078, which was complemented by an extended new test program. Previously (with the old test method), only the acceleration of the formhead in direction of impact has been measured. The new method is testing primarily how well the forehead and temple are protected by the helmet and whether the formhead is subject to a rotational movement during the fall. Both scenarios have a major influence on the severity of injuries. The test winner Melon stands out due to positive results especially in the category “handling and comfort”. “Aesthetics, handling, comfort and safety are the aspects on which we place very high value during development by using high quality materials and high quality suppliers.” says Michal Cervenka, CEO and creative head at Melon. Quality matters, with this the Melon Urban Active Helmet stands even the new extended testing methods achieving the score “satisfying” in protection of the forehead and temple areas and against turning movements of the head during a fall. A result which belongs to the best. Thus Melon already fulfills standards that might become future EU standards. Melon also achieved a suprising result in the sub-category “ventilation”. In this test the warm, helmeted formhead is cooled down within an air flow and afterwards the temperature is measured again. From all tested helmets with a “Classic Shell Shape” just one other helmet ventilated as well as Melon did. Despite the closed helmet shell this result is almost in the racing bike-helmet league. Michal Cervenka’s conclusion: “We are very happy about the fact, that after the multiple awards during the last years, 3 independet tests certify what our goal was from the beginning: Helmets do not have to look strange. Helmets can look nice, be light and still win such an important test. It remains a serious topic, which still can be fun: NO BRAIN NO GAME is our everyday practice.